Giving to the needy – kind of one of the cornerstones of loving neighbors and enemies as ourselves, right? I think he was also taking a jab at the uber-religious, too. 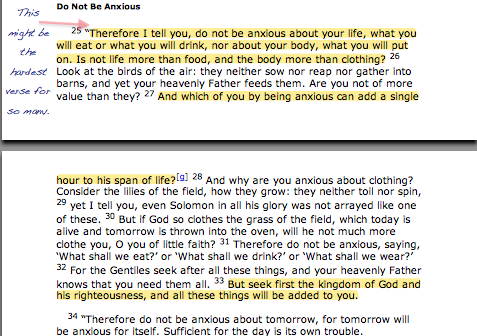 Matthew 6:5-8 gave me such a serious complex when I was growing up. I always wanted to make sure I was wording my prayers right, but not being too wordy (like the Gentile I am), in case someone thought I was showing off. I still worry sometimes that I’m just rambling – and I also wonder pretty often if what I’m saying makes God roll his eyes. “Dear God, please help me not get a cold sore.” “Dear God, please help me make the right decision.” “Dear God, what should I do next in my life?” Does God deal with all of our prayer requests? We grew up hearing that God says, “Yes,” “No,” or “Not now.” But I tend to think now that God says, “Hey, I care about you, but I’m not going to interfere with your life (for the most part). I want to see what decisions you choose to make, and how you handle the success or consequences.” But that is totally a guess – I don’t think I’ll ever know for sure how God does anything. That’s just how life has felt. I’ve asked for things and received them, and sometimes it has felt divine but most of the time it just feels logical or lucky or normal. And sometimes I asked for things and didn’t get them, and it turned out that it was a literal God-send that I didn’t get them after all. I went to a (non-Southern) Baptist church growing up. I loved (and still do) my church family at that church. They really were a family to me. They brought me up well, I think, and I’m so thankful for so much. I remember memorizing the Lord’s Prayer, but never really being asked to use it. 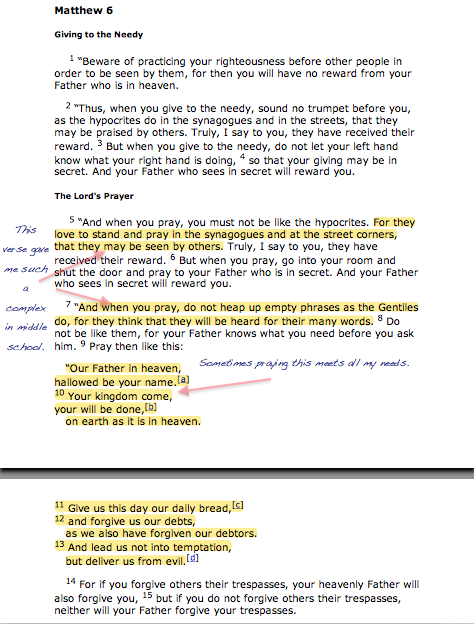 However, it’s such a concise prayer, and it covers all the bases without getting caught up in the perfect words. I’ve actually never fasted for Christian reasons. I have fasted for Ramadan, though. I’ve always found Christian/Catholic forms of fasting fairly anemic. Oh, you’re giving up candy? Boohoo. Try giving up anything in your mouth – even water or gum – from sun up to sun down. See if you don’t start to really understand what fasting is about. If you haven’t noticed, I am not a fan of the Prosperity Gospel. How is it even biblical? It seems about as far from Jesus’ words as you can get. Don’t store up treasures on earth – because that’s all you’re going to care about. And you’re not supposed to care about things, or yourself, but others and God. Don’t be stupid. Don’t be selfish. Boom. But then again, it’s hard. How much is too much? Should we all be bug-eating nomads like John? Should we give up absolutely everything? A house? A car? It probably depends on the person. At what point do you start adding things to your “I Want” list before you start thinking and acting on helping others meet their basic needs? I guess it’s a personal matter, but I’ve rarely been in the position where I’m doing that, and I’m not even well to do. Compared to giving up material goods, not being anxious is so much harder. I’ve had people whose mouths spoke all about Jesus and what was going on in their lives because of him, but their anxieties dictated all of their actions. I’ve been the same way on occasion. Thankfully, anxiety isn’t something that has really bothered me. But that’s because as long as you really do have faith in God, nothing should really bother you too much, right? At least, the way I see it is, the worst that can happen in any situation is… you die? And that’s probably not going to happen most of the time you make a decision. As long as you’re still alive, you still have options. That’s kind of morbid, though. 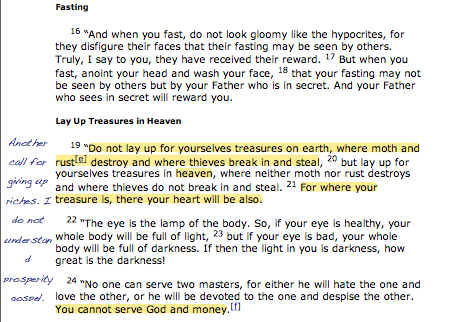 Loving money – do you have to give up everything to really follow Jesus’ commands? Prayers – What do you need to say? Is the Lord’s Prayer sufficient? Does he want us to chat with him like a friend?